Can you believe Christmas is here in a week and a half? "'Season's Greetings' is a greeting more commonly used as a motto on winter season greeting cards, and in commercial advertisements, than as a spoken phrase. In addition to 'Merry Christmas', Victorian Christmas cards bore a variety of salutations, including 'Compliments of the Season' and 'Christmas Greetings.' By the late 19th century, 'With the Season's Greetings' or simply 'The Season's Greetings' began appearing. 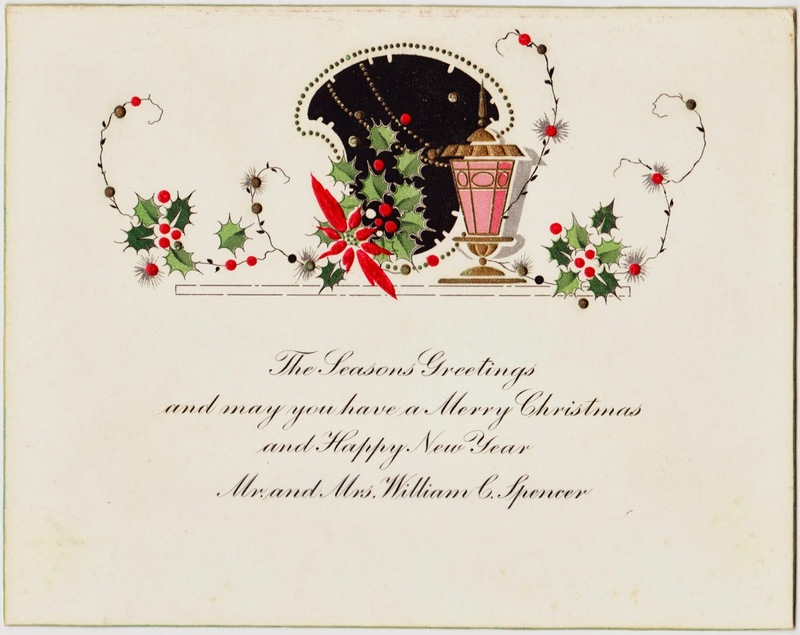 By the 1920s it had been shortened to 'Season's Greetings,' and has been a greeting card fixture ever since. Several White House Christmas cards, including U.S. President Dwight D. Eisenhower's 1955 card, have featured the phrase." Meanwhile, in related Christmas card news, have you seen this year's celebrity cards from Joe Jonas and Mena Suvari? They're worth a few moments of your time. * * *Check out more Christmas and holiday ephemera here.